Welcome to the Quilted Block of the Month for January 2018. We’re going to have a good time exploring Letha’s Electric Fan, I’m thinking this will be the block for February as well. This block has been on my “list” of blocks to make since I first saw it about 9 years ago because the arcs are offset causing visual movement. Fabric placement on this can be quite fun. Often with the block has an appliqued circle on the center, just as the fan Letha used would have. These fans generate just the perfect amount of air movement, making it easier to quilt in a hot stuffy room. The block looks really puffy right now, and will for some time as the quilting continues. For the circle, and the curved cross hatching I used Superior Threads 100 weight Micro Quilter. The bubbles and the center motif are 40 weight Magnifico. Later this week I’ll show hand drawings of each one of tho motifs. You’ll notice that the center is a play on one of the impractical color wheels. We’re going to have a bit of fun with this Quilted Block of the Month incorporating the impractical color wheel in this. So January is a two-fer. 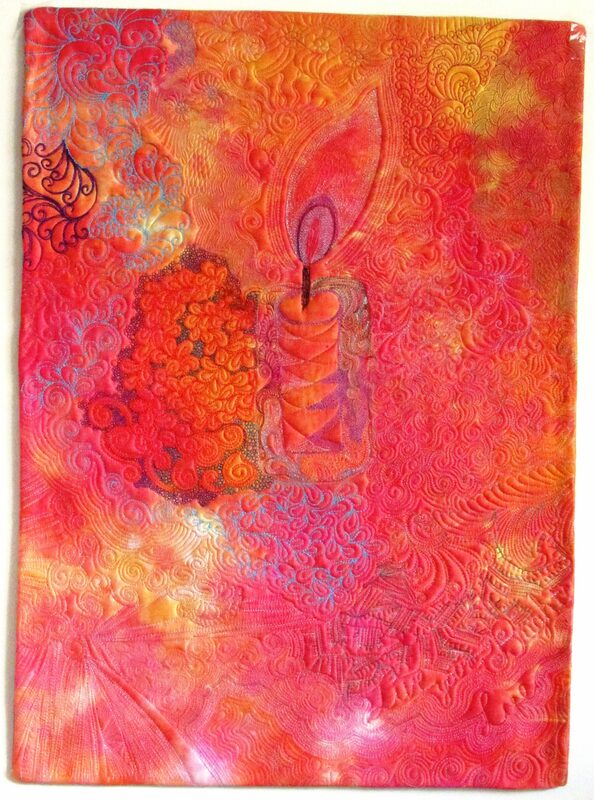 If you want to seen this in person come to the class at the Quilt Basket in Pawling on January 20th.